Cadillac SRX Review: Call it a sign of the times. Almost a year into the Obama administration and the government rescue of General Motors, Cadillac has introduced a new vehicle that's actually smaller and more fuel efficient than its predecessor. While you can't draw a direct line between the downsized Cadillac SRX and Washington's greener side, the SRX's development started long before that, and no doubt it's a harbinger of things to come. The federal government is requiring new cars to be far more efficient in the coming years, so more shrinkage like this can be expected. Judging from this Cadillac, that's not necessarily a bad thing. The new SRX is a five-seat crossover vehicle with a turbocharged V6 as its top engine. Compared to the old SRX, which could seat eight and offered V8 power, the new one feels nimble and sporty, more akin to the ultra-popular Lexus RX than a beefy American truck. It's a smart move from Cadillac, one that puts Lexus in its crosshairs more than ever before. For starters, the new SRX feels more car-like, which is what today's luxury buyer’s want. This isn't a vehicle that rocks like a boat through corners. If anything, it goes too far in the opposite direction, with a firm suspension that lets you feel the road in town and shocks that keep it planted on winding roads. Oddly enough, it has a better ride at highway speeds than it does in the city. It's a good freeway cruiser, as you'd expect from Cadillac, with the wonderful ability to soak up bumps and keep road noise out of the cabin. Compared to its chief competition at Lexus, the SRX offers some advantages. One is price. 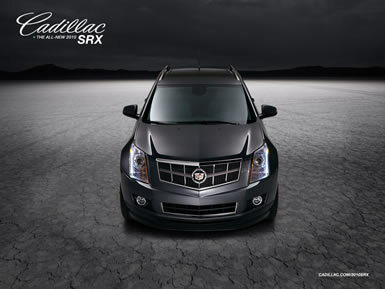 The well-equipped base version of the SRX starts at $33,330, compared to $37,250 for the most affordable RX. Another is style. While the Lexus has subdued, almost urban camouflage styling, the new SRX is brash and bold. There's nothing shy about it, with harsh creases and an aggressive front grille. Even the interior is bold with its use of wood and chrome trim. If you haven't seen Cadillac interiors in a couple of years, you'll want to check them out now. This new crossover borrows heavily from the newest CTS, which is a good thing, because it has the kind of ambiance that can match any luxury brand. Dramatic lighting at night, excellent materials and tight construction make it feel like a first-class cabin. Performance does stand out. The SRX feels fast enough with its base, non-turbocharged V6 engine, but it lacks the huge buckets of power some buyers expect in this class. But really, no one buys a car like this to win drag races. Overall, the new SRX makes a compelling case for people who want a stylish and efficient luxury SUV. It competes more directly with the popular five-seat crossovers, leaving people who need extra space to opt for the bigger and more truck-like Escalade. What was tested? The 2010 Cadillac SRX FWD Premium edition with a base MSRP price of $43,895. The options on the test car: The paint upgrade for $995 and a rear seat entertainment system for $1,295. The total MSRP price as tested including the $825 destination charge is $47,010. Why avoid it? Performance doesn't match some of its lighter, V8-powered competitors. Why buy it? It has a great combination of bold styling, nimble in-town handling, and a supple highway ride. And it's also more affordable than its chief competition at Lexus.